Happy New Year to all! It is lovely to be home in Rome again, recovering from holiday food and enjoying actual daylight again. Norway in December is very dark….. So, home again but what to cook? I found myself craving something light, vegetarian and crunchy, and thought of the Food52 article advocating A Grain, A Green, A Bean as a basic formula, recommended reading! So I improvised this from what was in the fridge last night, andit was very nice indeed. 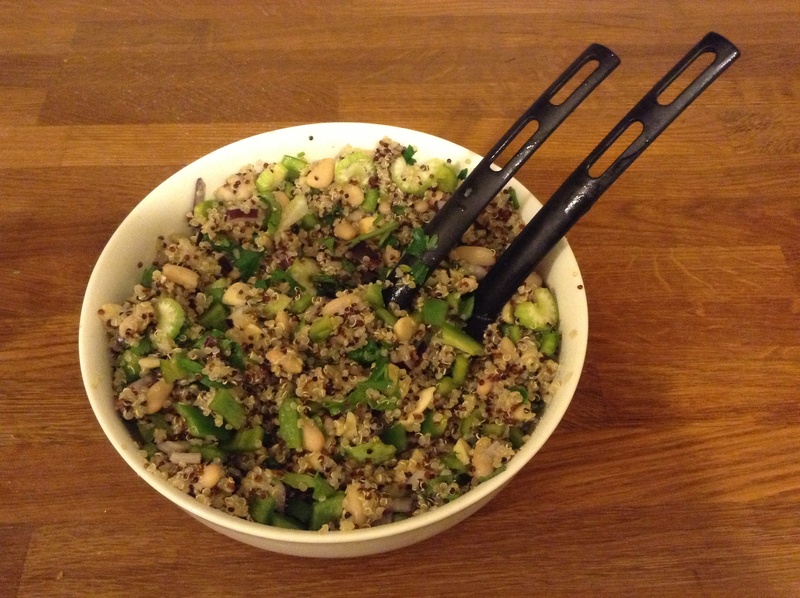 The ratio for cooking this quinoa was roughly 1:2 for quinoa: water volume, 10-15 minutes. So start by measuring out quinoa, then double that volume of water. (This amount was rather arbitrary, it was the content of the small glass jar in which the quinoa was stored, but the amount worked well.) Bring the water to the boil, then add the quinoa and leave to cook until it is fluffy and the water is absorbed. In the meanwhile, chop whatever vegetables you want to add in. I added mine raw, though roast veg could be nice too. After the holidays I just fancied something fresh and crunchy. Dice bell peppers, onion, celery, parsley. Drain and rinse the tinned beans (those were cooked). 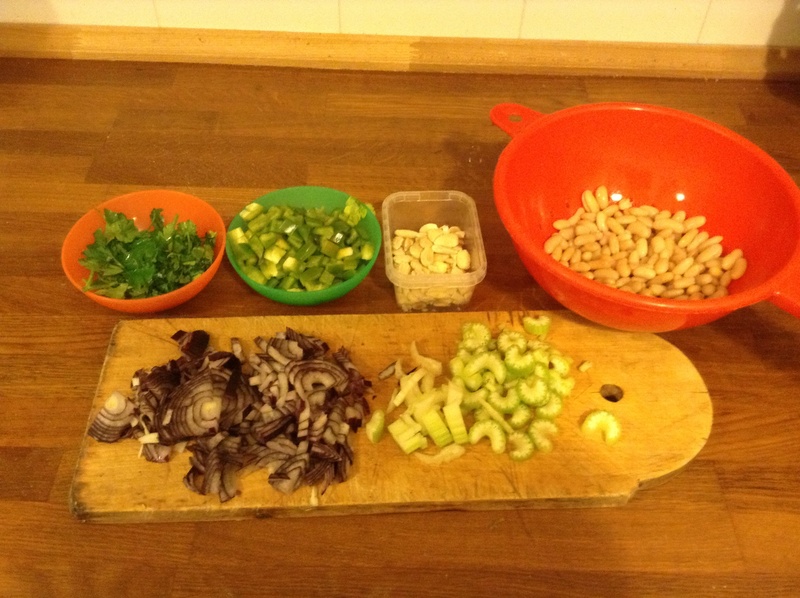 I added almonds for extra texture, and chopped those coarsely as well. 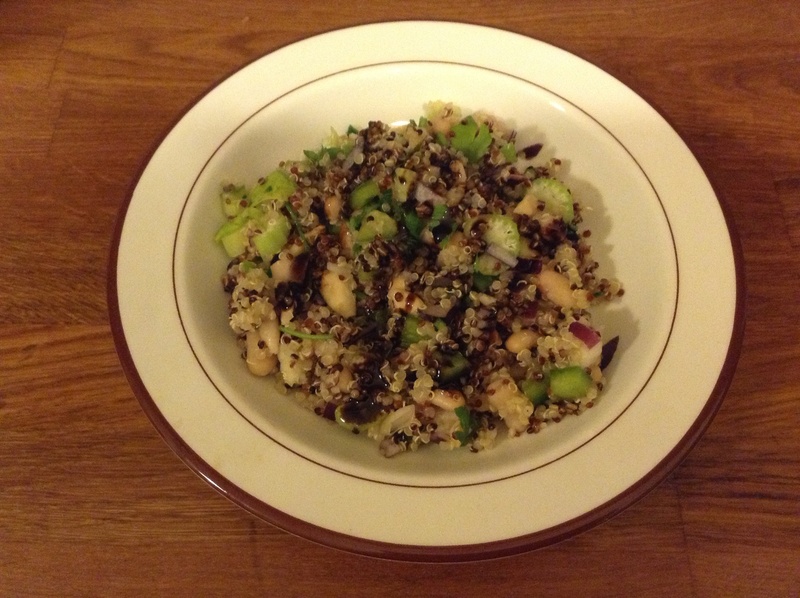 By now the quinoa was getting fluffy, but needed a few more minutes. And we had halloumi in the house! it is quite hard to find in Rome, but is so squeakingly satisfying in a salad. So I chopped the precious block of halloumi into wedges, and fried them quickly in a hot dry frying pan until they were a nice golden brown. We chopped those up to top the salad. Spoon the cooked quinoa (still warm) into a large bowl, and stir in all the waiting ingredients: bell peppers, onion, celery, parsley, beans, and almonds. Taste: this was nice, but was still missing something, so we added more salt and pepper and tasted again. Still not quite right, so we drizzled some balsamic vinegar glaze on, which brought the flavours nicely together. 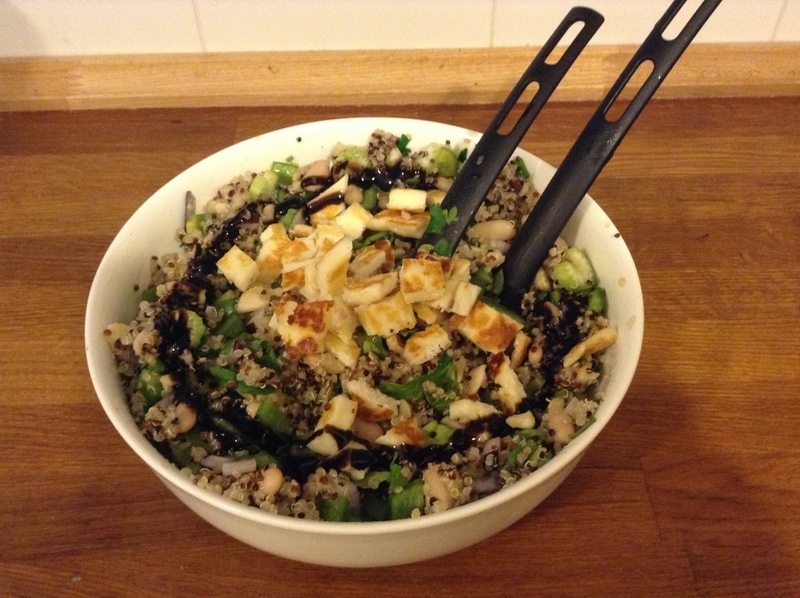 Top with grilled halloumi, and enjoy! Also excellent the next day for lunch! Anyone else have a good impromptu dish to recommend? 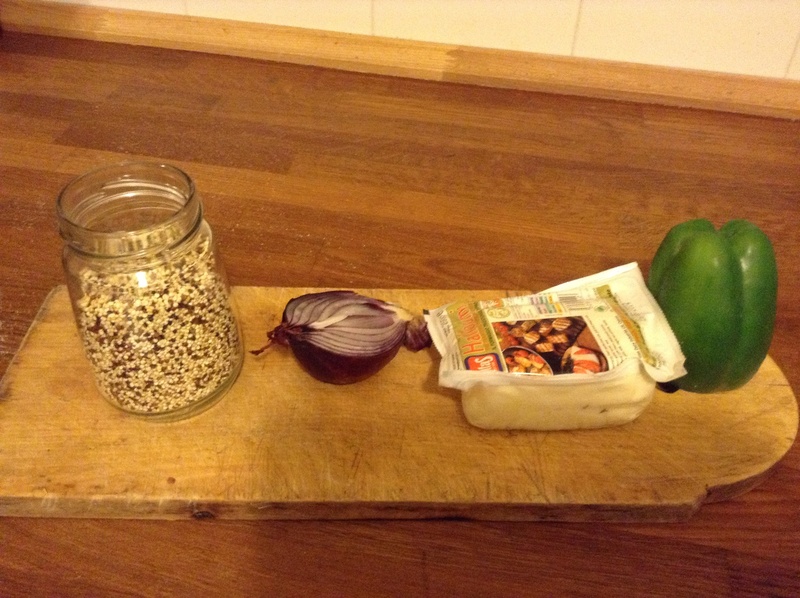 This entry was posted in food and tagged quinoa, salad, vegetarian on January 8, 2014 by krumkaker.